As the most basic substance that constitutes the world, Qi can be used to name everything in the world, so it is hard to classify it. However, Qi mentioned here is something concrete. Qi of the human body also has two patterns of existence. The coagulated Qi is manifested as various visible or structural components of the body, such as viscera, body figure, sense organs, Blood, Body Fluids and Essence; the diffused Qi is manifested as the Qi that flows in the body, but takes no certain form, such as Primordial Qi, Pectoral Qi, Nutritive Qi and Defensive Qi that is classified according to its distribution, origin, and function. Qi of the human body has two patterns of existence. The coagulated Qi is manifested as various visible or structural components; the diffused Qi is manifested as the Qi that flows in the body but takes no certain form, and is classified according to its distribution, origin, and function. Primordial Qi is also called "Inborn Qi", "Primary Qi" or "genuine Qi". It is the most important and fundamental of all, originates from the congenital essence (the innate essence stored in the kidney). But it also depends on the supplement and nourishment of the acquired essence developed in the spleen and stomach. It is received from heaven and combined with food essence to nourish the body. It commences from "the vital gate", the portion between the two kidneys, passes the triple warmer and circulates throughout the body. It goes inward to the five viscera and six bowels and outward to the superficial layer of the body. It goes everywhere and acts on all parts of the body. The primordial Qi has the functions of both activating growth and development and promoting the functional activities of all the viscera and bowels, channels and collaterals, tissues and other organs. Therefore, it is the motivating power of the vital activities of the human body. If Primordial Qi is deficient due to a congenital defect or improper feeding after birth, the functional activities of the whole body will become weakened. Pectoral Qi is also termed Great Qi, it accumulates in the thorax where Qi of the whole body converges. So the thorax is also known as "the sea of Qi". Pectoral Qi is a combination of the fresh air inhaled by the lung and the food essence derived by the spleen and stomach from water and grain. It is stored in the chest and poured into the channels of the heart and lung just as Miraculous Pivot (Lingshu), says: "It goes out of the lung and circulates through the larynx and pharynx. This is the reason why it exits when being exhaled and enters when being inhaled." The book Classified Canon compiled by Zhang Jiebin in 1624 A.D. says: "It goes down to the elixir field to be stored, and fills the Point Qijie of the yangming Channel from which it continues to go downward to the feet." Pectoral Qi has two main functions. One is that it flows through the respiratory tract to promote the respiratory movement of the lung and is involved in the loudness or softness of voice and words. The other is that it fills the heart channel to promote and adjust its beat, and to promote and adjust the circulation of blood and Qi. It also exerts an influence on the warmth and activities of the limbs. In short, it has the function of nourishing the lung and the heart, thus promoting respiration and blood circulation. Generally speaking, when Pectoral Qi is sufficient, the pulse will be moderate and forceful, and the Heart will beat rhythmically and evenly. If Pectoral Qi is deficient, the pulse will be swift, irregular, feeble or scattered. Pectoral Qi is usually considered a link connecting the functional activities of the Heart and those of the Lung. In the clinic, Deficiency of Pectoral Qi in most cases indicates Deficiency of Lung Qi leading to Deficiency of Heart Qi and ensuing Blood Stasis. For example, when a patient suffering from chronic bronchitis develops pulmonary Heart disease, which is marked by shortness of breath, a low voice, palpitation, a purplish face, running or intermittent pulse, etc., he or she can be diagnosed as having deficient Pectoral Qi. Nutritive Qi refers to the Qi circulating within the blood vessels and having a nourishing function. As it flows through the vessels with blood, it has such a close relationship with the latter that TCM often mentions them in a combined way "nourishing blood". In TCM, Blood consists mainly of two parts: Nutritive Qi and Body Fluids. Compared with defensive Qi, nourishing Qi belongs to yin, so it is also called "nourishing yin". Nutritive Qi comes mainly from the food essence transformed and transported by the spleen and stomach. After its formation, Nutritive Qi is sent to the Channels to flow in the order of the Twelve Regular Channels. This is why a chapter on Arthralgia-Syndrome of Plain Questions (Suwen) says: "What is nutritive Qi? It is actually the essence Qi transformed from food and water". Nutritive Qi originates from the middle warmer and enters the channels by way of the lung. It circulates throughout the body along one after another of the fourteen channels. The main functions of Nutritive Qi are to generate Blood and to nourish the whole body. That is, it flows into the channels through the lung and becomes a component of blood, and nourish the whole body for the physiological activities of all the viscera and bowels, channels and collaterals, tissues and other organs. Plain Questions says: "Nutritive Qi secretes its fluid, which enters the channels and turns into blood, thus nourishing the four extremities, the five viscera and the six bowels". Defensive Qi is the Qi moving outside the conduits and having protective functions. Compared with nourishing Qi, it belongs to yang, so it is also known as "defensive yang", it also comes from the food essence transformed and transported by the spleen and stomach. It is characterized by braveness in defense. That is why a chapter on Arthralgia-Syndrome of Plain Questions says: "Defensive Qi is a brave kind, which is produced by food and water." The distribution of Defensive Qi has two features: the flow following Nutritive Qi and free flow. The former indicates that Defensive Qi also goes along the Twelve Regular Channels, while the latter indicates that Qi is distributed all over the body. Defensive Qi circulates not within but outside the channels. 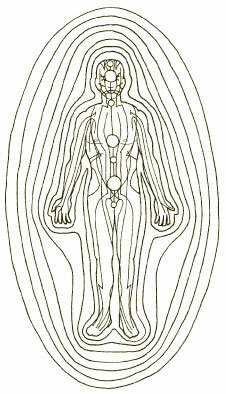 Being vaporized to the diaphragm and scattered in the chest and abdomen, it travels between the skin and flesh. In spite of circulating outside the channels, it still leans against the channels when moving. Defensive Qi has three functions. The first is guarding the surface of the body against exopathogen. The second is keeping a relatively constant body temperature by controlling the opening and closing of the muscular striae and adjusting the excretion of sweat due to its permeation to the muscular striae. The third is nourishing the viscera, bowels, muscles, skin and hair. When defensive Qi is insufficient, the defending function of the human body is weakened, the exopathogen invades the body easily, and the disease is hard to cure. Abnormal circulation of defensive Qi may cause sleep disorders. When defensive Qi is deficient, spontaneous sweating will occur. Nutritive Qi and defensive Qi have the same source. The former circulates within the channels, has the nourishing function and belongs to yin, whereas the latter circulates outside the channels, has the function of guarding the exterior of the body and belongs to yang. Only when they coordinate with each other can the opening and closing of the pores be kept normal, the body temperature constant, and the defending ability strong. [Click here to continue to section 7, "Modern investigations on Qi"].